The concept of continuity of care refers to the policy of assigning a primary caregiver to an infant at the time of enrollment in a child care program and continuing this relationship until the child is three years old or leaves the program." Ron Lally, Co-Director of West Ed:Center for Child & Family Studies. Combined with primary care giving (the process of assigning one caregiver to a child to serve as the main source of care), continuity of care provides the time and intimacy young children need to learn about themselves and form meaningful relationships with adutls. This model of child care effectively eliminates transitions for infants and toddlers, enabling young children to develop the secure, stable, predictable relationships with caregivers that will support their early learning and language development. Additionally, this model allows parents to develop long-term relationships with the classroom teachers and with parents of other children in the room. Educare, Quality Brief #1, December 2010. Children who are securely attached to parents and care teachers perform best on all rating scales - social, emotional and intellectual. The policy of enabling teachers to have deeper and longer relationships with fewer children also encourages teachers to remain at the same center, thus creating a more stable staff who will benefit from advanced training. Columbus Montessori was established in 1984 as a private, independent, not-for-profit school offering authentic Montessori education to a diverse community of families. The school serves children from ages six weeks through sixth grade. 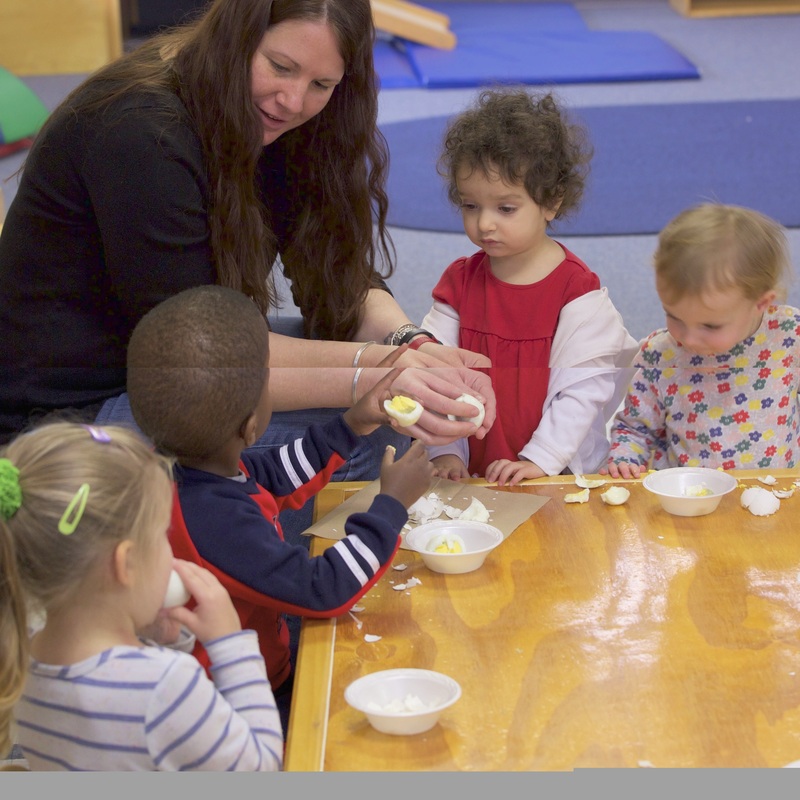 The full time Jessica Kass Center has served infants and toddlers in multi-aged communities with primary teachers since 1995, and is an early leader in establishing the value of the concept of family style groupings for children birth to three. Columbus Montessori also offers a Teacher Education Program that prepares adults to meet competencies for certification by the American Montessori Society (AMS) for teaching children, ages birth to six. The center is NAEYC accredited. 979 S. James Road, Columbus, OH, 43227; 614-231-3790; Jamie Gottesman, Executive Director. Established as a non-profit corporation in 1996, Kids Care Academy is a center of high quality Reggio-inspired comprehensive programs for the development of children from infancy through youth. The KCA staff are supportive of the family, promoting the healthy development of both children and parents. Although already a top quality center, in 2009 KCA transformed its infant and toddler program from single age groups to mixed-age groups in the belief that highest quality programs for children birth to three were best achieved in mixed-age, family style settings.The KCA story of transformation is attached through YouTube. The center is NAEYC accredited. 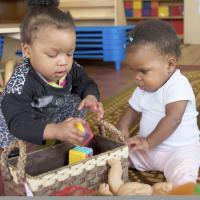 The Schoenbaum Family Center at Weinland Park offers child care and education for children from six weeks to age five, as well as providing training and support for parents of young children. Students from The Ohio State University observe learning in the classrooms and participate in classroom activities to practice effective guidance of child learning. The center is also associated with the OSU Crane Center for Early Childhood Research and Policy. The center evolved from the Sophie Rodgers Laboratory School (established in 1924) and was a pioneer in creating the concept and practice of mixed-aged classrooms for infants and toddlers. The center is NAEYC accredited. 175 E. 7th Ave., Columbus, OH, 43201; 614-292-9907; Annaliese Johnson, Lab School Director. Starting Point began the CC:B-3 project in 2009 by successfully converting one of its three infant and toddler classrooms from a single age group to a multi-age group. It soon completed the transformation of all of its infant-toddler classrooms to mixed-age groups. Starting Point is a comprehensive, proprietary, family owned center for children birth to five, and also serves school age children before and after school and in the summer. It is a partner of OSU Early Head Start, CDC Head Start, and the city of Columbus and the state of Ohio public pre-school programs.The center is NAEYC accredited. 2533 Lockbourne Road, Columbus, OH, 43207; 614-491-1914; Melissa Johnson, Owner.